When I heard that Microgaming were going to make a follow up to one of my all-time favorite video slots I was slightly worried. 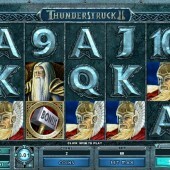 In 2010 Microgaming released Thunderstruck 2, which is the sequel to one of the best known high volatility online slots Thunderstruck. To say it would take some beating would be a massive understatement, but credit to Microgaming, they have done a very good job. For US players, Microgaming slots are not available to play online due to gaming laws in our country. Until they change we cannot play Thunderstruck 2 or any Microgaming games unfortunately. With Thunderstruck 2 we get an increased number in lines, up to 243-ways and the Norse Gods have grown too to bring in Freya the Valkyrie, Loki and Odin to sit along side the original Thunder God Thor. The volatility has dropped significantly from the original though with a change in game engine although the maximum payout has grown to a whopping 8100x bet available in the newly created Wildstorm feature! The 'softening' of the Thunderstruck theme hasn't appealed much to lovers of the original 9-liner game. However, it has introduced many new players to the Norse God theme with its sharp graphics, dramatic soundtrack and flashing animations. 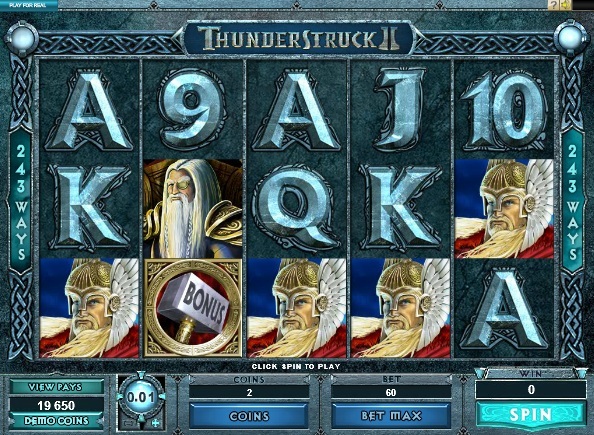 Thunderstruck 2 enjoys a higher RTP at 96.57% and 3 extra free games rounds to choose in the the Hall of Spins with, all can be unlocked as you progress through the features - one level is unlocked after each 5 triggers, so by the time you have activated 15 bonus rounds you can choose from any of the features.. Thor's hammer whacking a hard surface is the bonus symbol and appears as a single icon on any of the reels. To get through to the bonus round you need 3 or more bonus hammer scatters to appear on any of the reels. This will let you pick your bonus character from a choice of Valkyrie, Loki, Odin and Thor, as long as you have activated them. If you haven’t activated them through your play then they won’t be available. You bonus will consist of a number of free spins between 10 and 25 and a feature such as magic wilds, crow multipliers, extra symbols and more. The bonus can retrigger at any time, which will add more free spins to your amount. Did Microgaming do Thunderstruck justice with this sequel? I think so. Thunderstuck 2 is a very playable and addictive slot, so beware. For me it is up there with Tombraider slot and the medieval themed Avalon as one of the most visited slots in their range when I get a chance to play them. Microgaming seem to rate the game engine for Thunderstuck 2, having used it for their blockbuster gothic slot Immortal Romance - its virtually the same game with a few small adjustments.